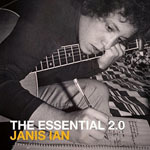 Share the post "Album review: JANIS IAN – The Essential 2.0"
This 2 CD collection neatly brings together, for the first time, some of Ian’s best (?) works spanning her whole career from 1967 to date on the Columbia, Verve And Rude Girl labels. All too often there are ‘gaps’ in these sorts of anthologies. And 2.0 is no exception. CD1 covers three decades, with three of her Sixties albums, and two from the Seventies, not getting so much as a look in. Even acknowledged classics like Between The Lines (1975) which was Grammy nominated for Album of the Year and Best engineered recording, and spawned the single At Seventeen which was nominated for Record Of The Year, Song Of The Year, and Best Pop Female Vocalist, only gets to dip a meagre two toes into this compilation. But when you’ve got a recording career spanning 22 studio albums to represent over just 32 tracks, it’s always going to be a balancing act. I must confess to not being particularly well versed in Ian or her music, so for me this was very much a voyage of exploration. The two tracks taken from her eponymous 1967 debut – Society’s Child and Hair Of Spun Gold (recorded when she was only 15) – are musically very much of their time, lyrically show a worldliness beyond her years, and have weathered the years particularly well. I’d like to have heard more of her material from this era. Similarly, the 1970′s – represented here by about one third of the tracks on offer – the material demonstrating how Ian developed into a very fine bittersweet singer songwriter, setting out a template that many – like Suzanne Vega, would pick up and run with in the years that followed. Again, it’s a period that merits deeper investigation. CD 2, is for me, something of a mixed bag – skipping over the Eighties, and exploring jazzier and more avant garde pastures of less personal appeal. A quarter of the tracks are also ‘live’ versions. This entry was posted in ALBUM REVIEWS, ALBUM REVIEWS (Mobile), All Posts and tagged acoustic, album, compilation, folk, Greatest Hits, Janis Ian, review, rock, singer songwriter, The Essential 2.0. Bookmark the permalink.